Having been in the industry for many years I would confidently recommend Leandro and his team. The work was carried out in a professional and Timely manner. He possesses a great attention to detail and craftsmanship. 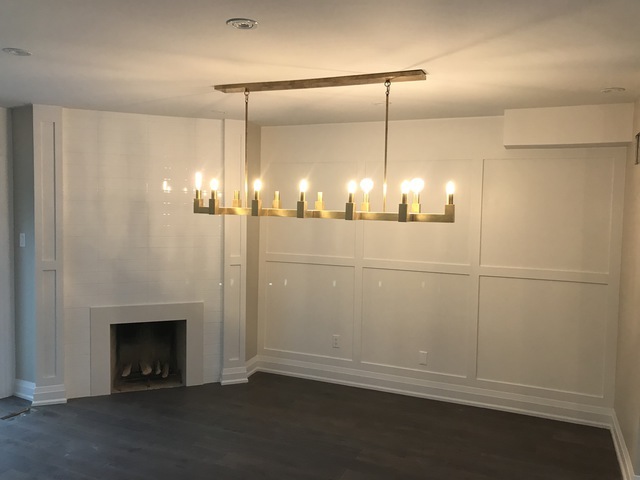 Leandro and his crew installed approximately 1000' of poplar baseboard, casing backbend and hung 30 solid doors a well as extensive wainscoting throughout the home. All work was performed as per contract and to my satisfaction. I wouldn't hesitate to call upon Leandro for future business. Leandro is one of the best trades professionals I encountered during my home renovation. He worked with our budget, while never compromising the quality of his work or timelines. Leandro is someone I’d use again and recommend highly. Thank you so much Andreia for your review. It was a great pleasure for me to have work with you and be able to serve you with the best of our abilities. Full house installing all doors and woodwork! The work was done with precision and tack. Everything was installed to my liking and was meticulously finished and the site was always clean! Many thanks,​ Susan and Tony for your review. It was a great pleasure for us to have work with you and be able to serve you with the best of our abilities. Absolutely a great experience with a client that we have had the opportunity to work. The first project that Leandro did for me is the complete my interior finish carpentry for a 2800 sq ft home. Baseboard, window casing, hanging doors and hardward, etc. Leandro's work is very meticulous, he does a great job cleaning up after his work at the end of each day. Overall beautiful job! The second job I hired him for was to complete the wrapping of exterior posts and lining the ceiling of a porch with wood. The job was completed with the same standard i have grown accustomed for his work and I was not disappointed. Leandro is someone that will consistently show up for the day he has committed to, is highly trustworthy and very respectful. After the job was done, I told him he feel like a member of our family!! Thank you Leandro for the great work! Many thanks,​ Heather for your review. It was a great pleasure for Uniline Finish Carpentry teamwork to have met you and your family and be able to serve you with the best of our abilities. Absolutely a great experience with a client that we have had the opportunity to work with once again. Professional, courteous and built exactly what we wanted. Leandro went the extra mile to source the best materials for the best price and was very patient when we were making design decisions. He also connected me to a good painter who finished the job. I highly recommend Leandro for any finish carpentry work! Many thanks Ida and Peter. It was great meeting you​. It was our pleasure to have the opportunity to work with you. very good attention to details, clean and close fit of all mill work, very good workmanship... has done work for us at several sites, on time and on budget, pleasure to work with. Many thanks, ​Domenic. It's always our pleasure to work with you. We'll be always at your service. Leo and his crew were very professional and showed up on time and when he promised to. Their work is very precise with quality workmanship. We definitely look forward to doing more business with Leandro in the future. Many thanks Pawconstruction. We at Uniline Finish Carpentry hope to keep working with you in the future building a strong and trustworthy business relationship and meet all our clients expectations. Trim Carpentry and interior doors. Excellent work! Completed on time and on budget. Kept the job site very clean and was mindful of existing finished areas of the house. Thank you very much. It was great working with you once again. dependability, customer service, and uniqueness. We love what we do. Every project is made with passion and engagement. Our desire to produce excellent work runs deep - that's what let us handle every project with fresh energy and enthusiasm. Don't give your project to just any company! Our experience and knowledge will help you to create the best experience work, because we strive toward work that drives action, and generates results. We are a team of professionals working in the construction industry for more than 20 years and we commit ourselves to constant improvement. Our mission is to delight our clients with the best solutions from our company for their dream projects. We work hard every day to make Uniline the most respected service provider that clients recommend to family and friends. The best according to the customer buget.